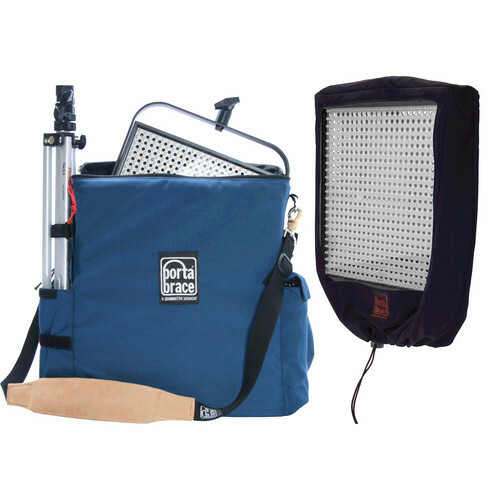 The Porta Brace LP-LP1X1 Carrying Case, in signature blue, is designed to carry a 1x1 LED light panel. It can carry a Litepanels 1x1, a Kino Flo BarFly 100 or 200 fluorescent system, a Kino Flo Desk-Lite, a LEDZ BRUTE 16 or 30" LED production light, or similar-sized items. The case has a water-resistant 1000-denier Cordura nylon exterior and a foam-padded main compartment. There is thick, padded "U"-shaped foam at the base of the case for extra protection against drops. It has an exterior pouch for a light stand on the side, an external pocket for cables and batteries, and an interior, soft padded pouch for carrying gels. For carrying more than one item, two cases can be attached and carried as a single case. It is carried by a removable, adjustable strap with a suede leather pad. May fit other select 1x1 panels. Please measure your select light against specified dimensions prior to ordering. Box Dimensions (LxWxH) 19.5 x 18.3 x 6.6"
LP-LP1X1 Carrying Case for 1x1 Light Panel (Signature Blue) is rated 5.0 out of 5 by 1. Rated 5 out of 5 by Bought from Worth it Bought it to organize my 1X1 litepanels. Didn't realize that the case was for only one, but I managed to fit two 1X1 litepanels in it, cables, gels, and even a reflector. So, it is pretty spacious. I even fit two lightstands on the side pockets. My only gripe about this product is the quality of the carry handle, but it's not that bad(wouldve been nice to have some padding on it). I love the fact that it also came with a mini flashlight keychain too, that was cute. Yes, it's a little expensive, but you are getting what you pay for.